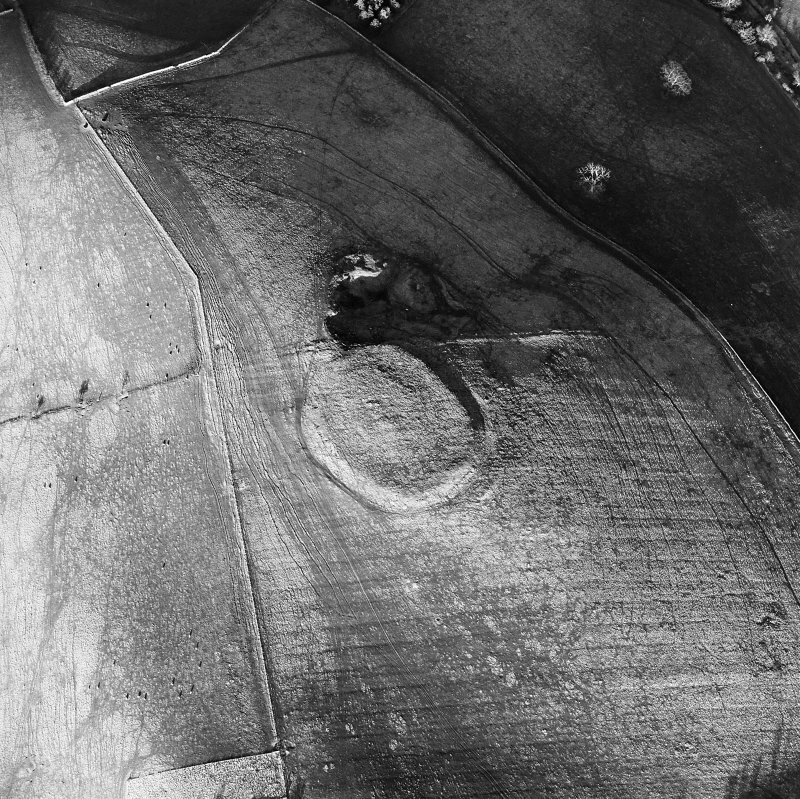 Oblique aerial view centred on the remains of the fort and settlement with fort adjacent, taken from the WSW. 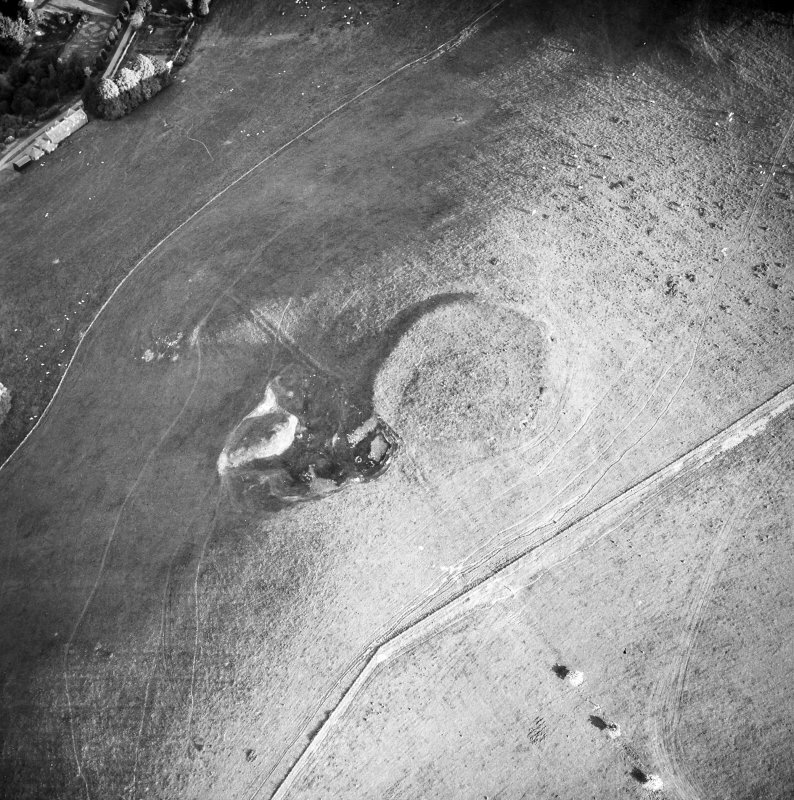 Oblique aerial view centred on the remains of the fort and quarry, taken from the N.
Oblique aerial view centred on the remains of the fort and quarry, taken from the WNW. 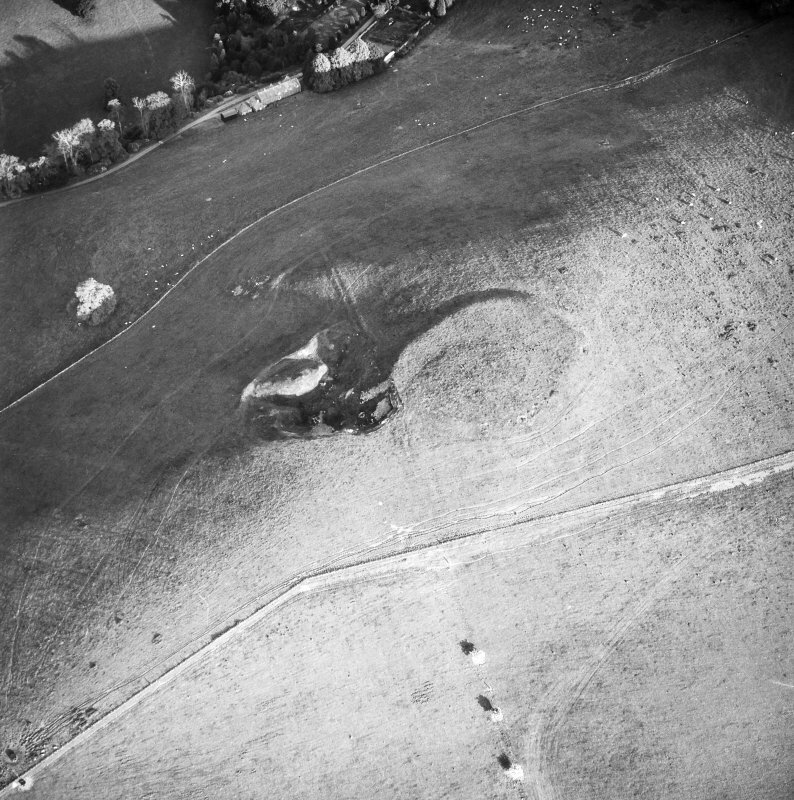 Oblique aerial view centred on the remains of the fort and quarry, taken from the NW. 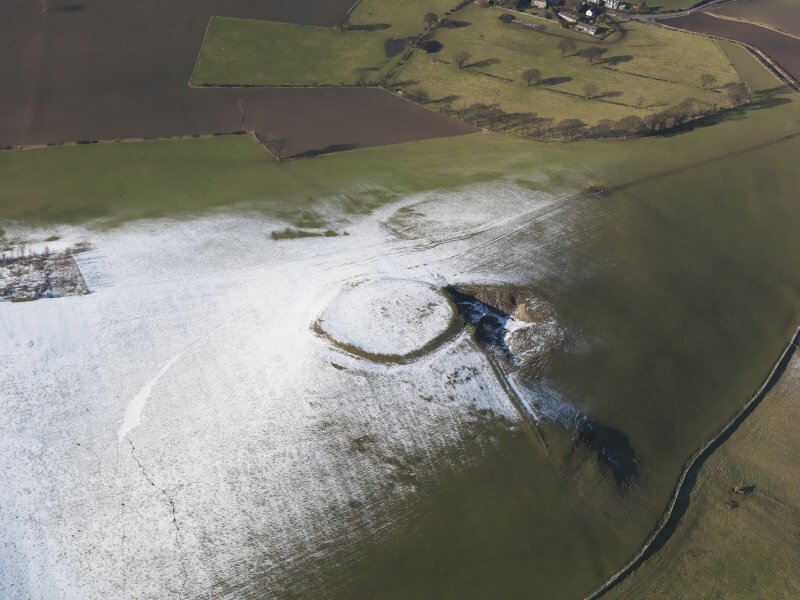 General aerial view of the fort and quarry under snow, looking to NNW. 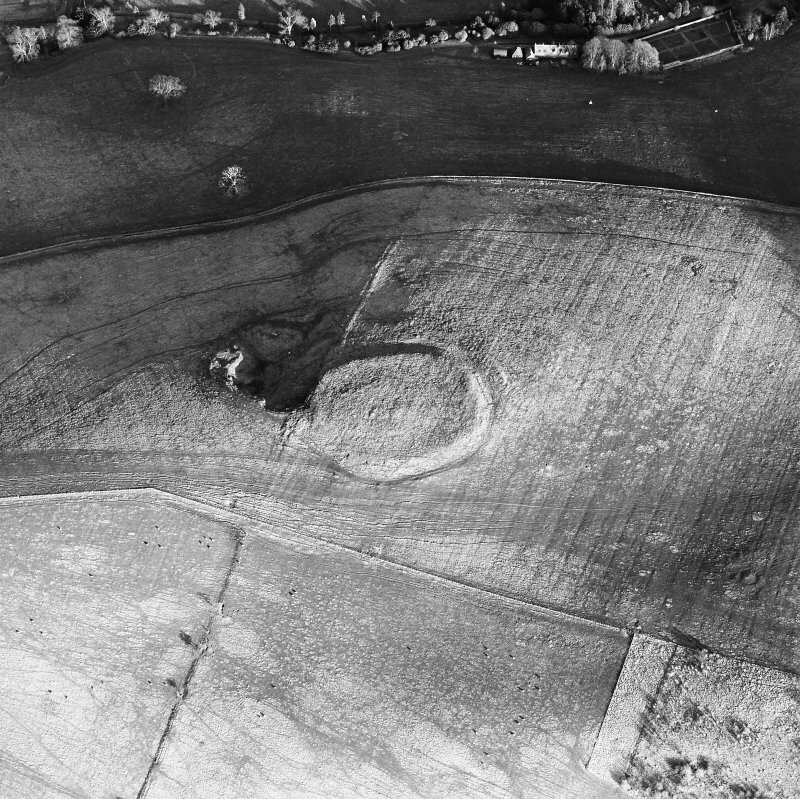 Oblique aerial view centred on the remains of the fort and settlement with fort adjacent, taken from the WNW. 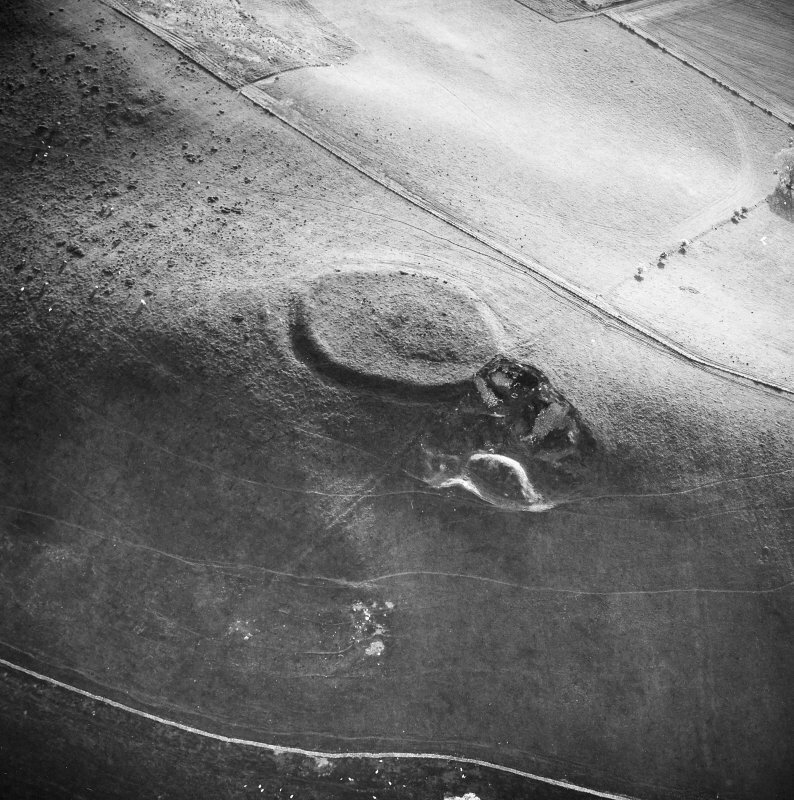 Oblique aerial view centred on forts from SW.
Oblique aerial view centred on the remains of the fort and quarry, taken from the WSW. 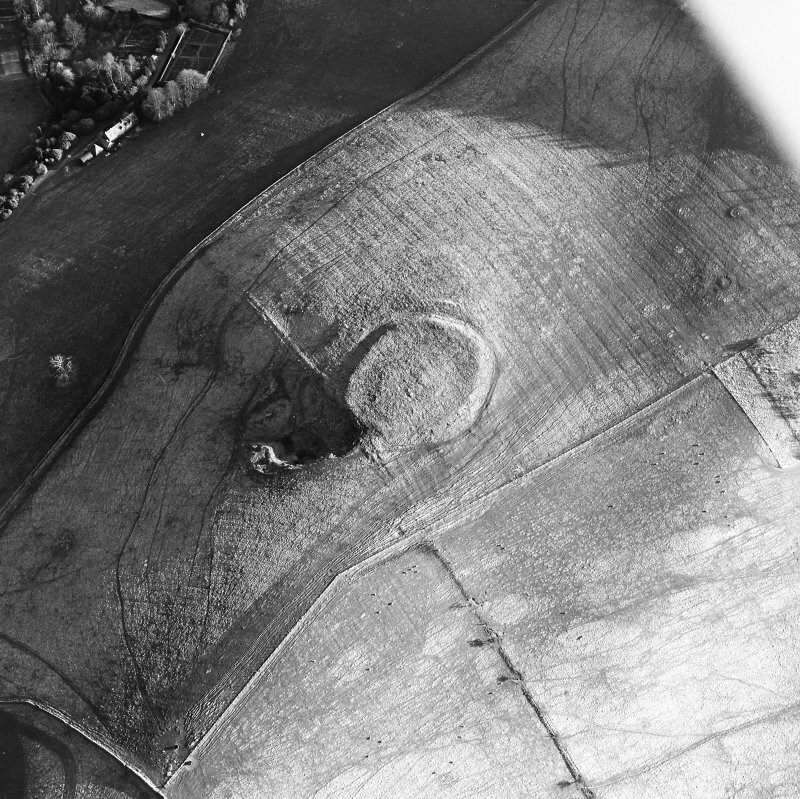 Oblique aerial view centred on the remains of the fort and quarry, taken from the NNW. 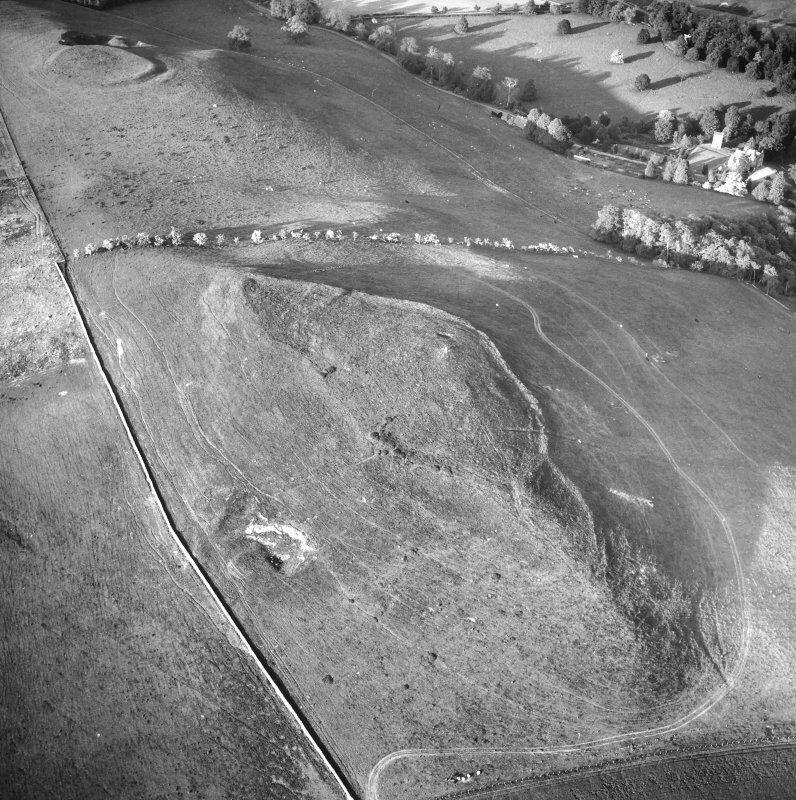 Oblique aerial view centred on the remains of the fort and settlement with fort adjacent, taken from the SW.
Fort, NE. 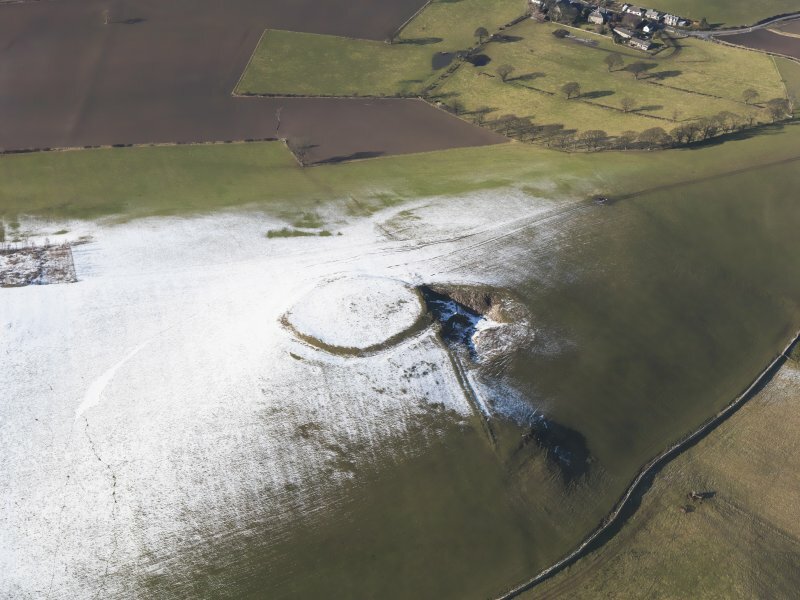 of Morebattle Hill. On the crest of the spur that runs NE. 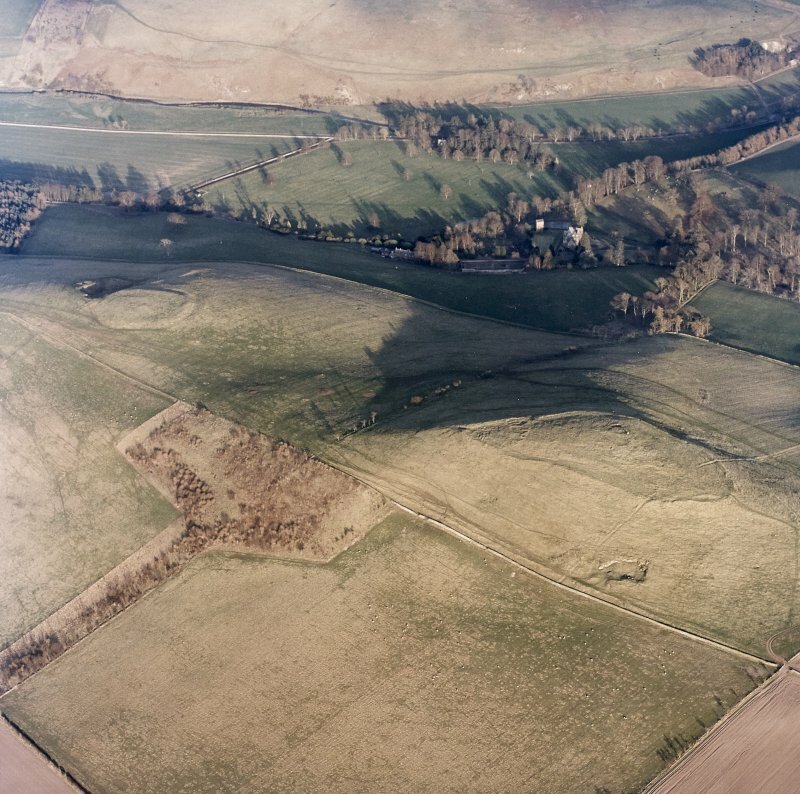 from Morebattle Hill, a quarter of a mile from No.646 (RCAHMS 1956), and at a height of 600ft OD, there is an oval fort, largely levelled by cultivation, which originally measured some 220ft from N to S by 170ft from E to W within double concentric ramparts and a medial ditch (See RCAHMS 1956 plan, fig.436). 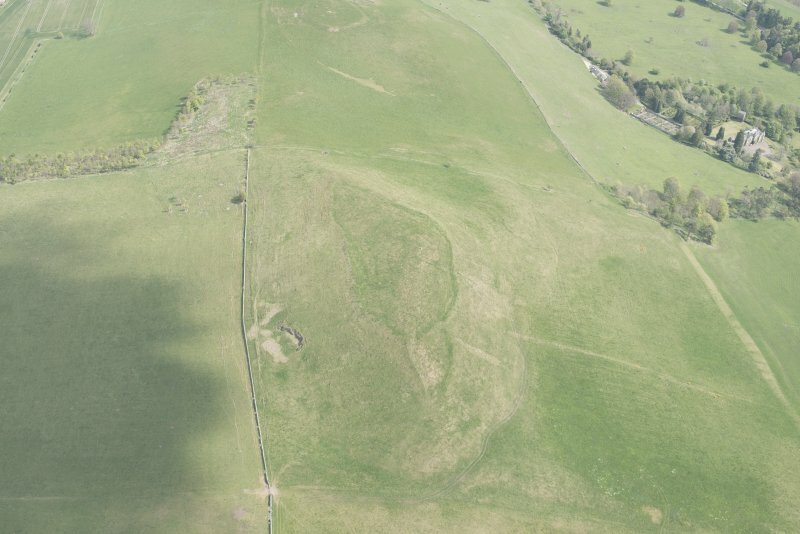 The fort is built on a slight knoll, the rocky top of which still protrudes through the turf near the centre of the site, and the inner rampart was drawn round the margin of the summit-area: the sides of the knoll appear to have been trimmed to form a con- tinuous scarp extending from the base of the rampart to the bottom of the medial ditch. 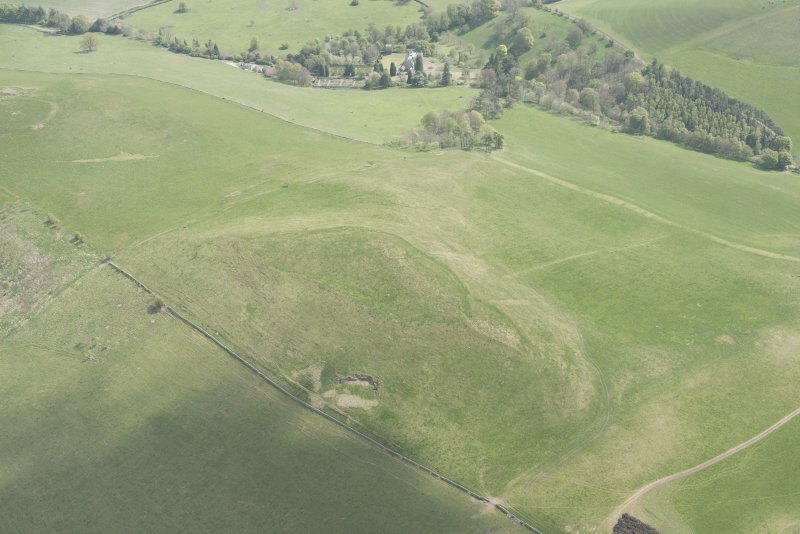 At the S. apex the inner rampart is still represented by a mound up to 3ft 6in in height above the interior, but elsewhere it has been entirely ploughed out. 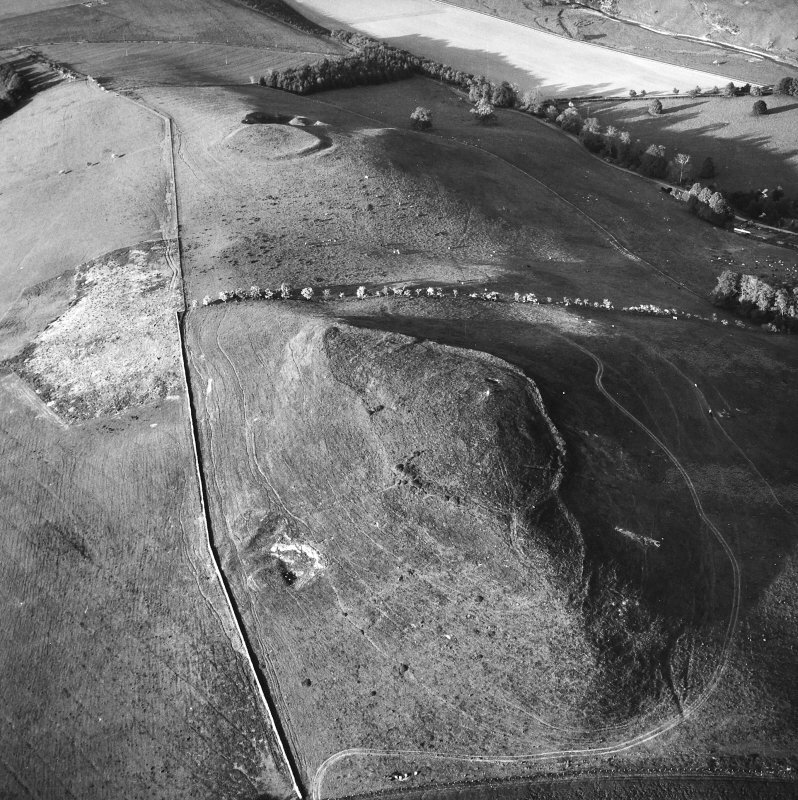 A few tumbled boulders exposed in the face of the scarp on the NW and SW arcs suggest that it may have been revetted with drystone walling. 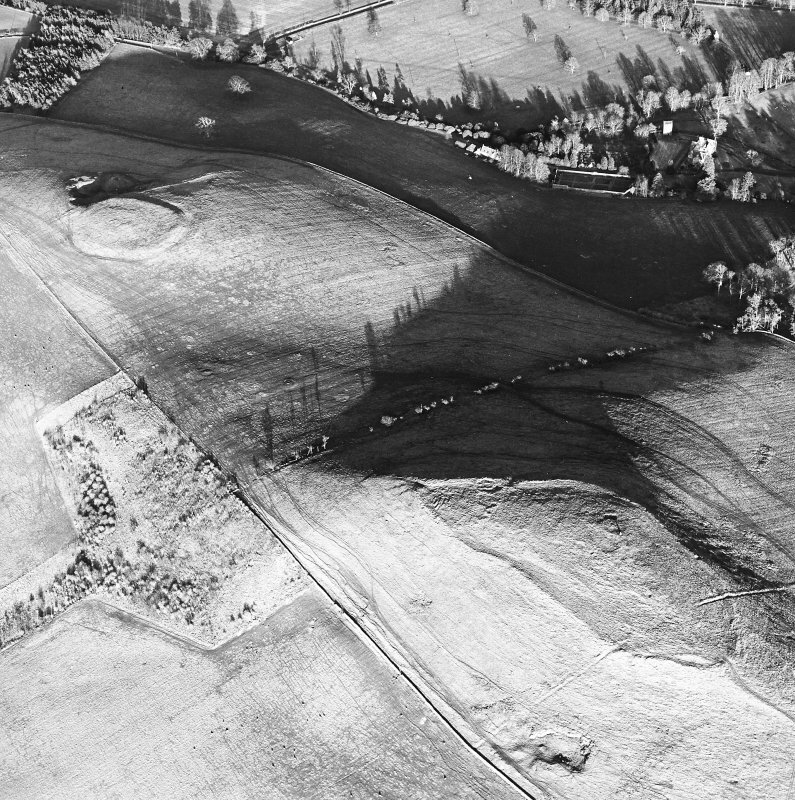 The ditch is completely silted up round the W half of the perimeter and is only a few inches deep elsewhere; while the outer rampart, which is shown as practically continuous on the 1899 edition of the OS map, (RCAHMS 1956), is now reduced to a segment 60ft in length and up to 2ft high at the S apex. 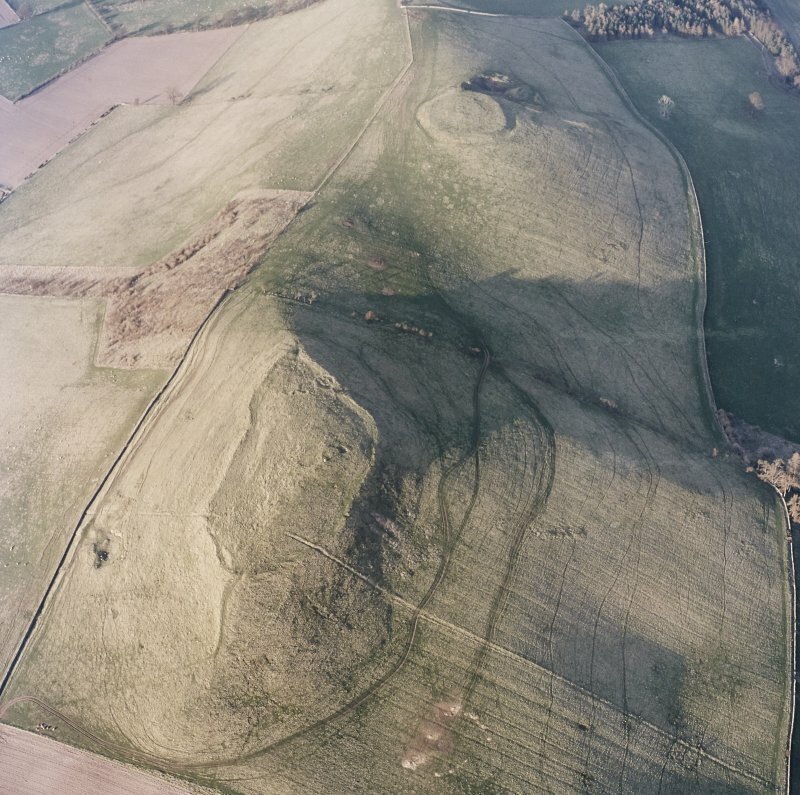 The entrance was presumably situated at the NNE end where a quarry, long disused, has cut into the base of the knoll and has destroyed the inner rampart for a distance of 60ft. The interior is featureless. 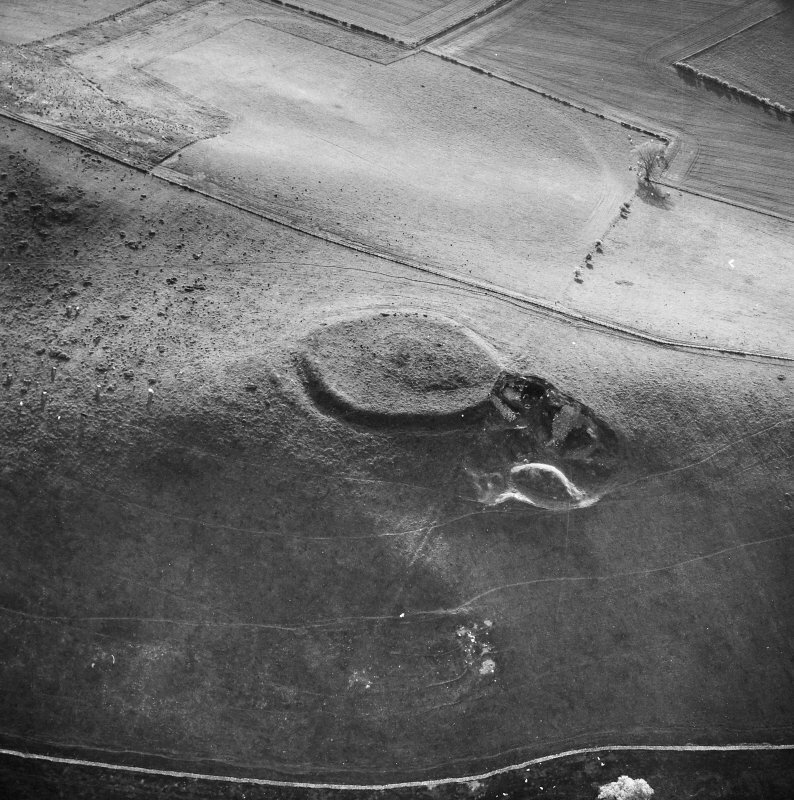 RCAHMS 1956, visited 27 August 1947. Visited by OS (EGC) 11 June 1968. 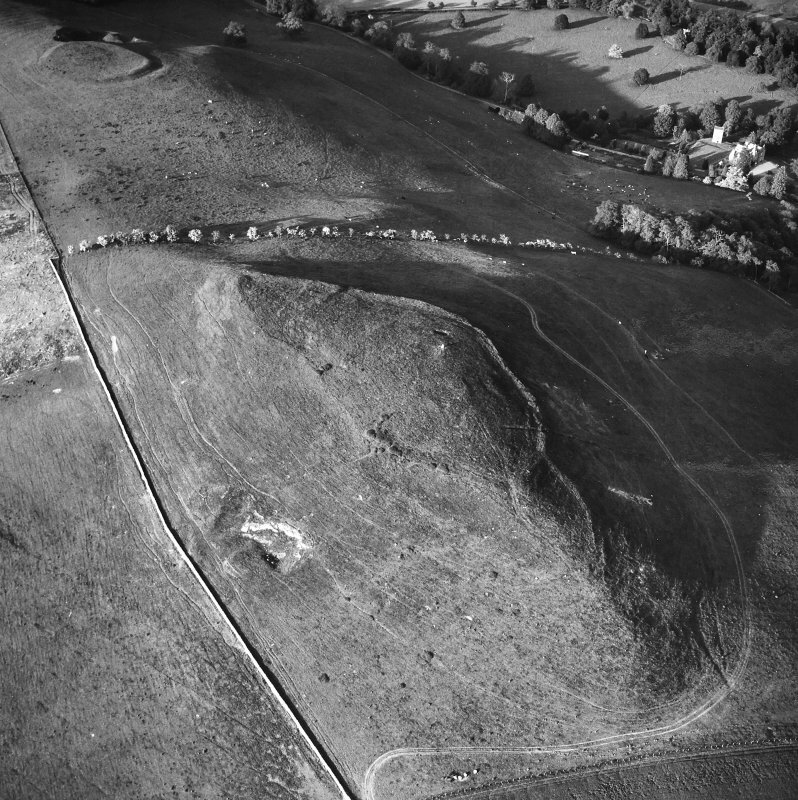 This fort is situated on a slight knoll on the N spur of Morebattle Hill. 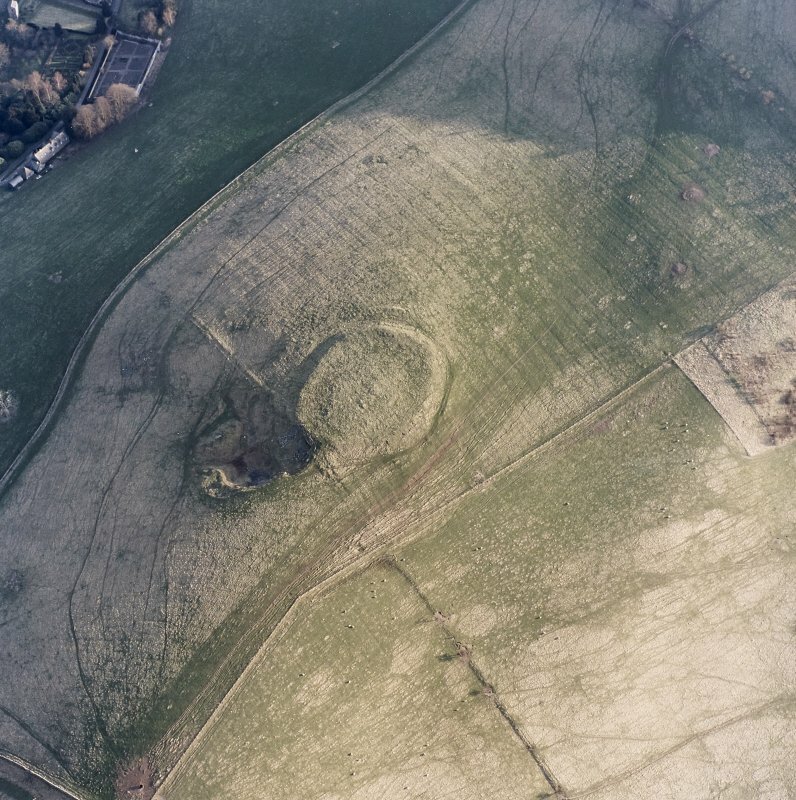 Oval on plan, it measures about 62m from N to S by 52m transversely within twin ramparts with a medial ditch. 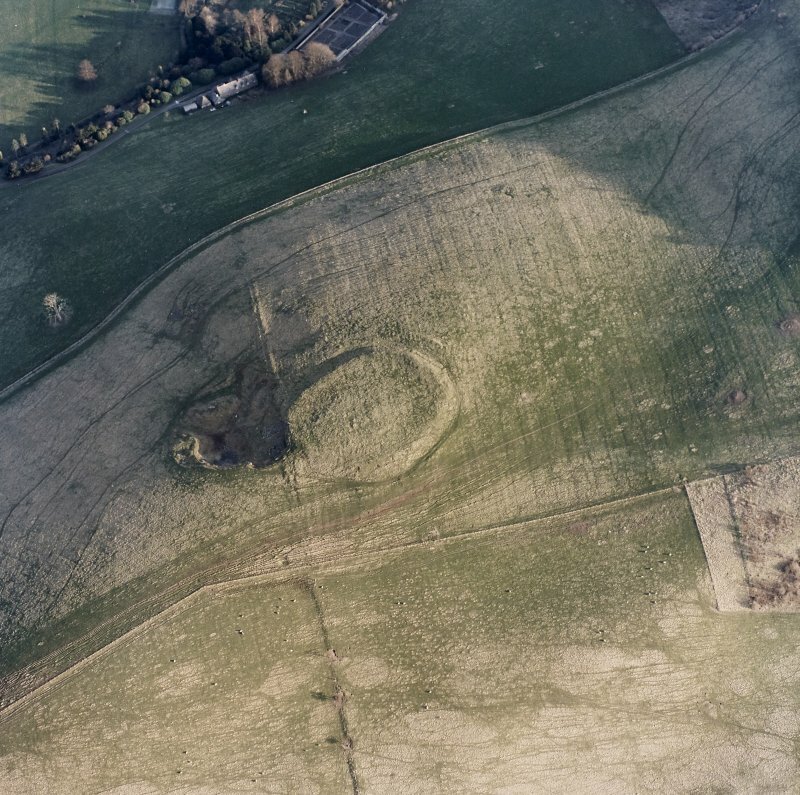 On the S the inner rampart still stands to a height of about 1m above the level of the interior, but elsewhere it has been ploughed down, along with the ditch and the counterscarp rampart, the latter only visible in places around the E flank. 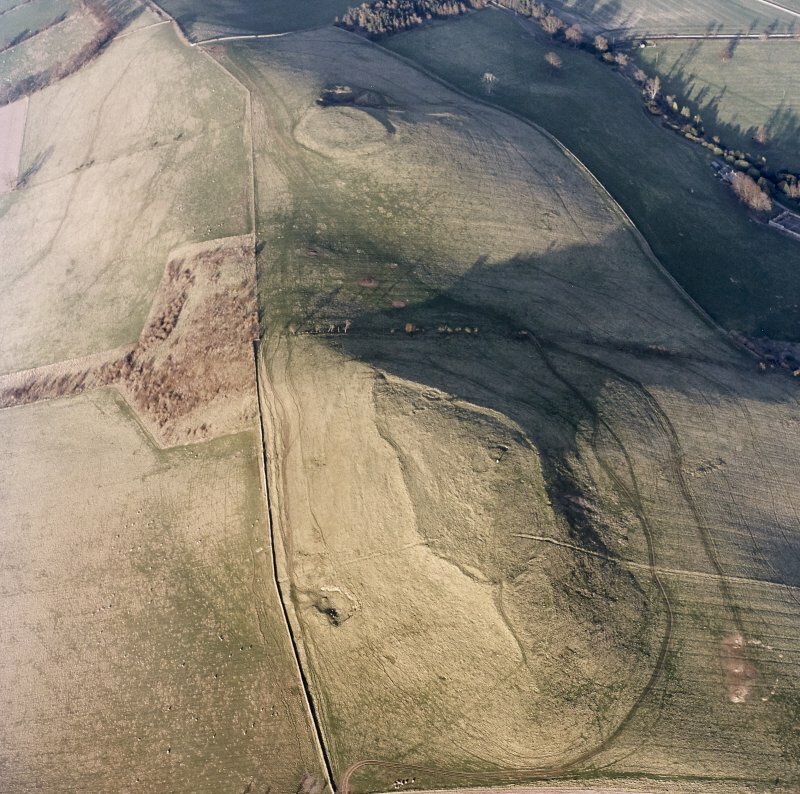 The entrance was presumably on the NNE, where an old quarry has created the only gap in the circuit. The interior is featureless.